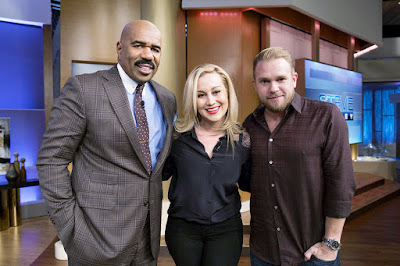 Steve Harvey had fiery country artist and star of CMT’s I Love Kellie Pickler, return Tuesday, Oct. 11 to recap having “one of his favorite contestants” on Family Feud and discuss a favorite app and most recent tattoo celebrating her and her husband, Kyle Jacobs’ marriage. During the interview, Harvey played the viral clip of Pickler’s appearance on Family Feud, where the country-music charmer was so excited she scared the chatty host speechless, before sitting down with her. After watching the clip from CMT’s I Love Kellie Pickler showing the Platinum-certified “Best Days of Your Life” singer getting a meaningful tattoo — her wedding date in Roman numerals on her forearm in Jacobs’ handwriting — the bubbly Dancing With The Stars winner explained how she likes the feeling of getting tattoos. Catch I Love Kellie Pickler Thursdays at 10:00 / 9:00 p.m. CT on CMT.